A JOHN BYRNE production. The long-awaited debut of Marvels Canadian mutant team Alpha Flight is forced to decide what the future holds for them, but not before battling the man-mountain called Tundra. 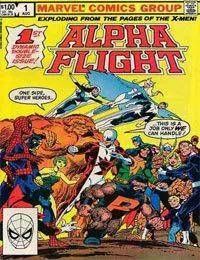 The 48-page introduction to what will be the smash-hit series of 1983.<br />This is the 1st issue of John Byrnes Alpha Flight. After leaning that Dept. H is shutting down the Alpha Flight program, Vindicator is sure that the team is done for ever.<br />But a super natural monster name Tundra is unleashed on the Canadian countryside and Alpha Flight is called back into action -- but not by the Canadian Government. Vindicators wife, Heather, acutally takes it upon herself to call the team back to help Vindicator in the fight. In doing so she also calls in 2 Beta Flight members, Puck and Marrina to help previous Alpha Flight members Aurora, Northstar, Sasquatch, Shaman and Snowbird.